The wild daffodil's interactions are diverse and crucial to the plant's survival. The most important interaction that this plant undergoes is the process of pollination, which can occur with many different species. In order to fertilize the daffodil's ovule, pollen must be transported, usually by insects, from the stamen of a different daffodil plant. This pollen dusts the feet of organisms such as bees and butterflies. 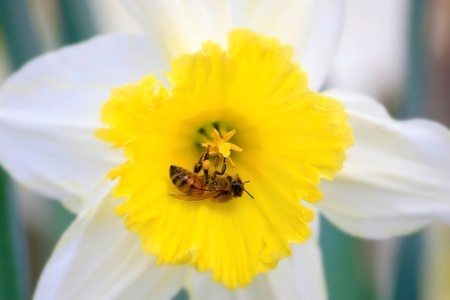 Some examples of insects that help the daffodil become fertilized include the rusty-patched bumble bee, the European honey bee, and the monarch butterfly. These insects become attracted to the daffodil's bright flowers, seeking the plant's nectar for nourishment. When the insect lands on the flower, pollen collects on the insect's feet. The insect, after getting its fill of the daffodil's nectar, flies to another plant of the same species, distributing the pollen so that it fertilizes the second plant. Insects are pivotal to the propagation of wild daffodils. This is a mutualistic relationship, meaning that both organisms benefit from the interaction. The insect receives nutrition from the daffodil, and the daffodil's pollen is transported by the insect in order for reproduction to occur successfully. Narcissus pseudonarcissus undergoes daily interactions with such insects, providing essential food for the flying pollinators. However, the daffodil is not a plant that other animals have a desire to eat. The daffodil contains deadly poison in the form of alkaloids. If enough of the plant is consumed, the alkaloids can cause serious harm to animals that would eat it, including humans. The daffodil's poison and the effects thereof are discussed more on the facts page. Another interaction that is sometimes overlooked is the relationship between the wild daffodil and mycorrhizal fungi. These fungi grow around the daffodil's roots, forming a usually mutualistic relationship. The mycorrhizae help the plant absorb nutrients more efficiently and grow more quickly. 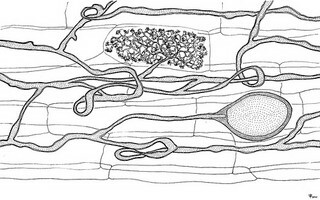 In return, the fungus receives much-needed carbon from the plant. In a food web, the wild daffodil would be classified as a primary producer, providing nutrition for insects and not much else. The toxicity of the daffodil's poison causes adverse effects in specific quantities, causing most herbivores to avoid it entirely. 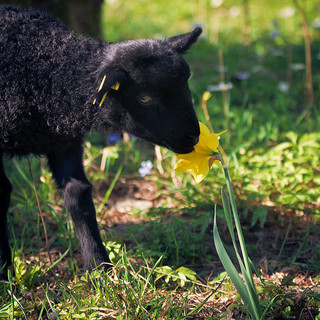 The lamb in the picture below will probably undergo some unpleasant consequences from consuming a daffodil for its meal. As for humans, the interactions between daffodils and people are quite common, though the plant is clearly not used for food. Wild daffodils are a beautiful addition to any garden, and their adaptations make the plant a hardy survivor through difficult growing seasons. You can learn more about the daffodil's distinctive attributes on the adaptation page. Though humans come in contact with Narcissus pseudonarcissus on a fairly regular basis, they too can suffer from the daffodil's toxic properties. One major result of working with wild daffodils is a rash known as "daffodil itch." If sap from the daffodil touches human skin, a rash resembling eczema will form on a person. Sores can develop at the site of the rash, and it becomes quite painful for the affected victim. Most "daffodil itch" rashes are confined to the wrists and hands of humans, as a result of harvesting the plants manually. After a couple weeks, the rash will eventually fade as long as further contact with the daffodil plant is not made. However, it is simple for people to avoid this unpleasant consequence by wearing protective clothing. Waterproof gloves can shield the skin from coming in contact with sap. Follow this link to revisit the homepage.